Hey, hope everyone has had a great January thus far. 2012 is flying by already. My little guy is 6 months old today! When people tell you that kids grow up fast, you nod, agree with them, but only half believe them. Until… your baby is born, then screaming, then laughing and smiling, then rolling, then eating solids, then cutting teeth… and soon crawling, and now 6 months old! It really does jet past. My advice to others (and myself included), set down the laundry, stop doing the dishes, and spend time with your kids. The dishes and laundry will always be there and never change, kids are different. Enjoy them. Every moment. They’ll remember you spending time with them too. Don’t get me wrong, you do need to get those things done, but in time. It doesn’t always have to be done right away. 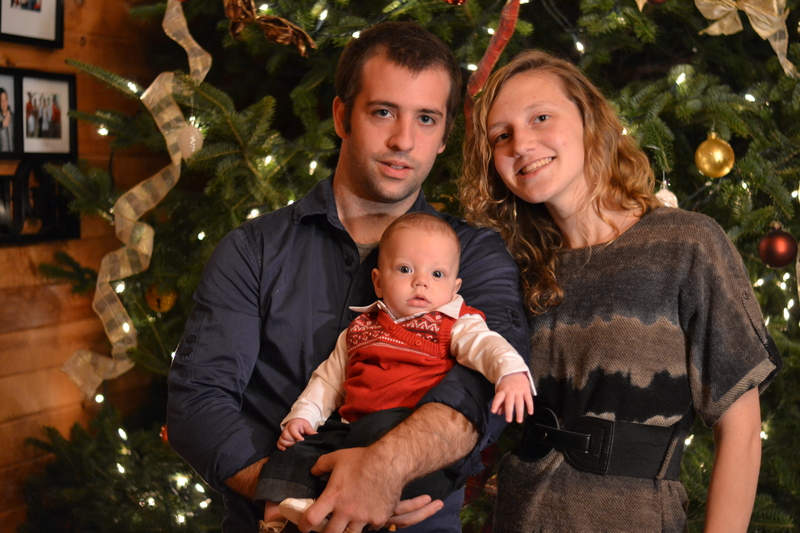 Our first family Christmas photo with our baby. Okay, so I’m really proud of myself right now. Second post in under a month. Must be a record for me. We went out this afternoon for lunch, it was awesome. If you’re ever in NS, Canada, check out the Kiwi Cafe. It’s sweet. Today, I’ll fulfill my promise of sharing my cookie dough ball recipes with you. I made these for a cookie exchange (one of two in two days… haha) over Christmas, and they were really great. Sad thing was, I didn’t make extra for myself, and only got to sample half of each. Guess it helped with my holiday weight gain that way… sigh. Oh well. Next year, we’re making a triple batch! 😉 I made two different recipes for this exchange. 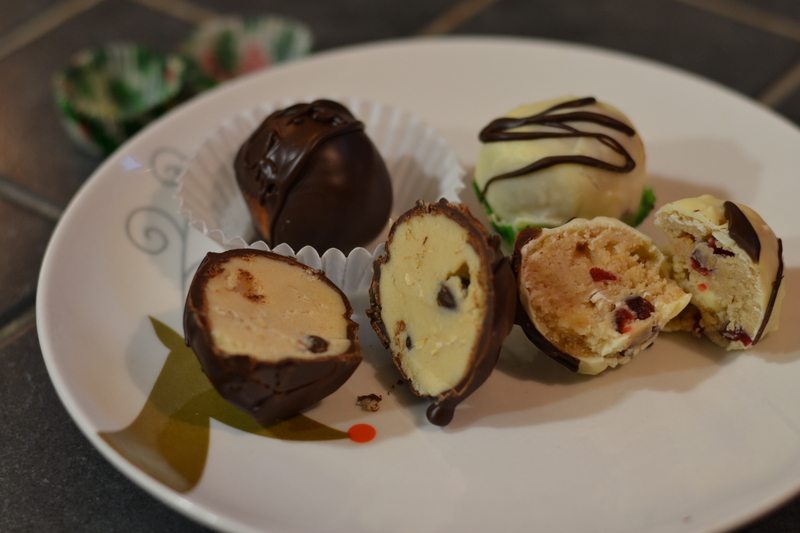 Chocolate Chip Cookie Dough Balls, and Cranberry White Chocolate Skor Cookie Dough Balls (or CWCSCDB for… short? Haha.). Just a note – these recipes are especially for my friend Amanda, who tried these and loved them (I love hearing people enjoy food I make…!). Don’t they look great? Good enough to eat? The chocolate chip balls were an idea I found on Pinterest, and adapted slightly to my own liking. The other recipe was adapted from a cookie recipe given to me by a friend (they were actually supposed to be made into cookies for ice cream sandwiches, which I intend to try sometime!). So! First off, Chocolate Chip Cookie Dough Balls! Coating: 1 pkg chocolate chips and 1/4 cup Parofin Wax. Beat margarine and sugars in a large bowl with electric mixer of medium speed until light and fluffy. Add milk and vanilla. Stir in flour, baking soda, oats and salt and mix on low-speed (or stir by hand) until incorporated. Stir in chocolate chips. Form dough into 1″ balls and arrange on a baking sheet lined with waxed paper. 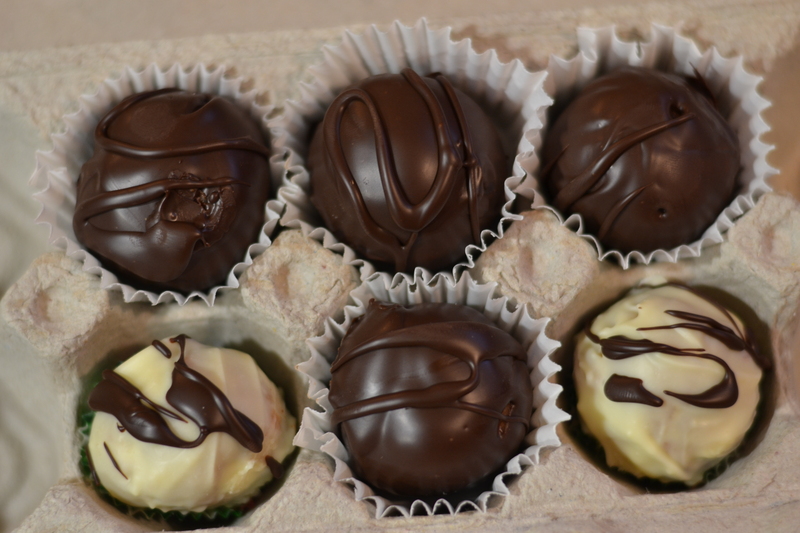 Melt chocolate and wax in a double boiler. 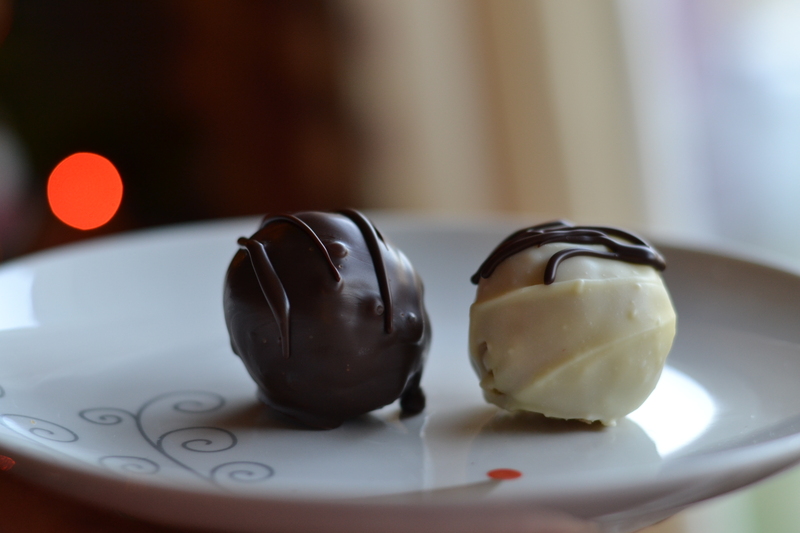 Using spoon, dip cookie balls into chocolate coating to cover. Tap on side of pan to remove any excess coating, and return to waxed paper-lined baking sheets. Chill until set. AND NOW, for the amazing Cranberry White Chocolate Skor Cookie Dough Balls. Makes about 2 1/2 dozen. Beat butter, and sugars in large bowl with electric mixer on medium speed until light and fluffy. Add milk and vanilla. Stir in flour, baking soda, oats and salt and mix on low-speed (or stir by hand) until incorporated. Stir in chips, Skor bits, and cranberries. Form dough into 1″ balls and arrange on a baking sheet lined with waxed paper. Melt chocolate and wax in a double boiler. 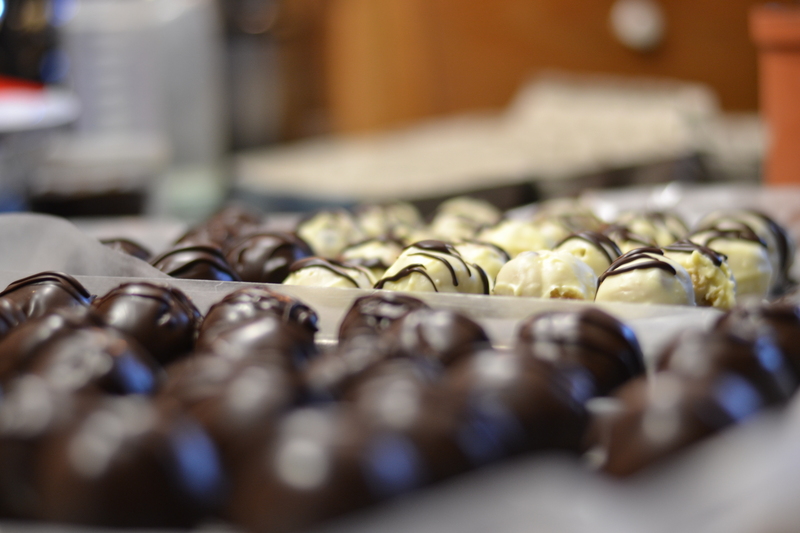 Using spoon, dip cookie balls into chocolate coating to cover. Tap on side of pan to remove any excess coating, and return to waxed paper-lined baking sheets. Chill until set. They look good, inside and out. So, I think these turned out wonderfully. I stuck the recipes on them too. At the cookie exchange, there was a prize for the best packaging. I had seen in a magazine a few ideas for food gifts. 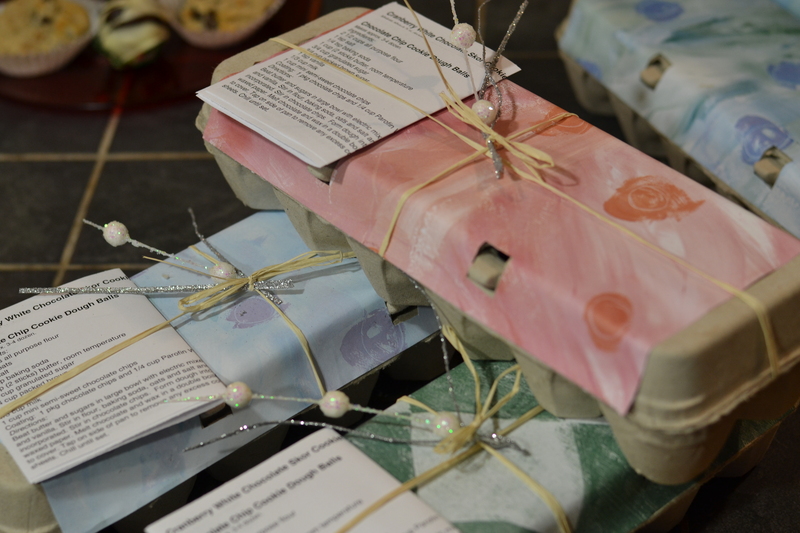 One of them was to use an egg carton and scrapbooking paper. I tried it – and it looked really neat. It’s a great idea recycling-wise, and it won the prize too! 🙂 All you had to do was cut a strip of paper the size of the top of the carton (the part that lifts) and then cut out the holes where it closes, and glue it on.I put my cookie balls in the carton in small paper cups and then wrapped the carton with raffia and stuck in a sprig of a decoration thing that we’d picked up. Hope you enjoyed the recipe. Did anyone else try anything new this holiday season? Have you guys discovered Pinterest yet? So they’re literally cookie dough?! no bake? you know i LOVE no bake! haha so i have to tell you.. i also love when people enjoy my baking and i love to bake so its a win win! Those muffins I made and put a picture on facebook recently, the chocolate cream cheese ones… i took some to work and they were a huge hit. one of the guys gave me $20 today to make him a batch. haha. That’s awesome. They looked really good. Recipe please? 20 bucks! You go girl.